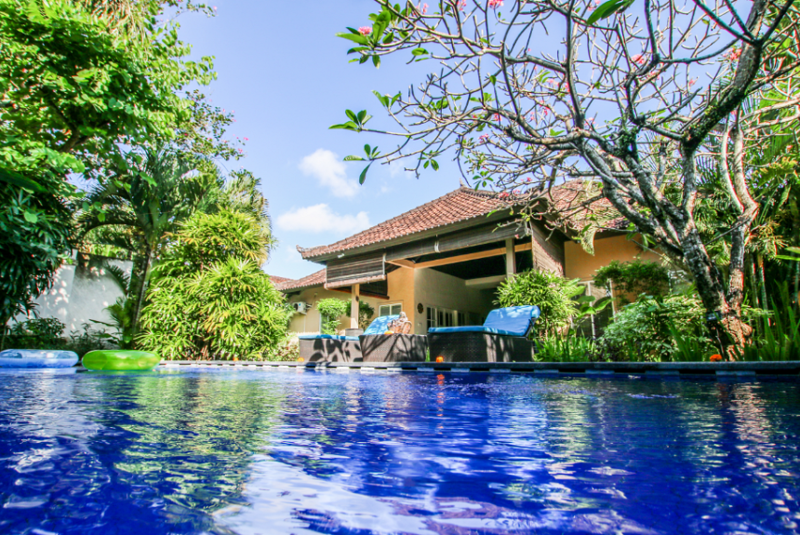 LUXURY 3 bedrooms Villa Lotus (renovated in February 2016) is located in a small dead end quiet street, just 800 meters from the beach, famous KUDETA beach club and 2 minutes walking to the Oberoi street with the best Seminyak's Restaurants and Bars. Also, a big supermarket Coco mart just in 5 minutes walking distance from villa. Villa is 400 m2 with amazing tropical plants and trees, big swimming pool and modern lounge zone in the Frangipani tree shadow. Open space living room with full equipped kitchen, comfortable sofas, TV and bar table is also perfect place for relaxing. There are big ceiling fans to make fresh wind during the hot day time. Kitchenette with gas stove, refrigerator, microwave oven, cooking utensils, water dispenser, kitchenware and tableware. Bedrooms are spacious and new designed. All bedrooms have air conditioners and en-suite bathrooms with shower, bath tube and hot water. All beds are KING-size 180x200 cm with high quality linens.